Texas Monthly magazine teamed up with the Best Companies Group to rank the state’s top 100 employers. Companies named Best Companies to Work for in Texas for 2018 were divided into 23 large, 33 medium-sized and 44 small companies by the number of people they employ in Texas. The ranking was based on an employer inventory of practices and an anonymous survey of associates, who were asked to agree or disagree with dozens of statements about the firm, teamwork and their individual experience at the firm. 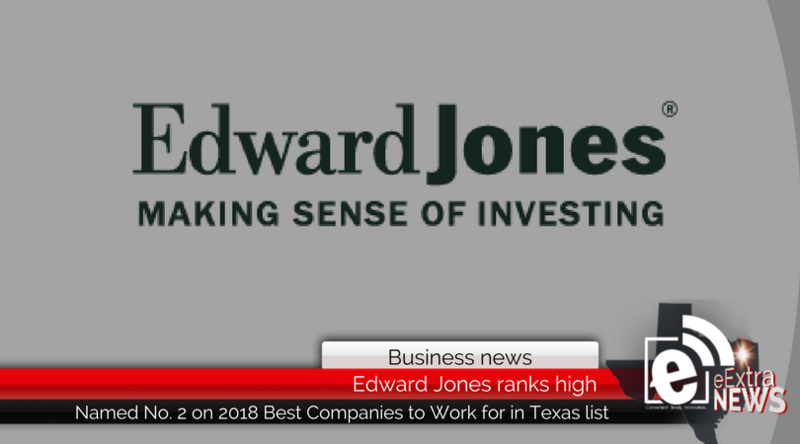 For 14 consecutive years, Edward Jones has ranked in the top 10 Best Companies to Work for in Texas. Edward Jones has 1,318 branch offices all over Texas. The firm is growing, adding branches and seeking new financial advisors who are interested in operating an entrepreneurial office with the support and benefits of one of the oldest and largest firms in the industry. Edward Jones, a Fortune 500 company, provides financial services in the U.S. and, through its affiliate, in Canada. Every aspect of the firm’s business, from the investments its financial advisors offer to the location of its branch offices, caters to individual investors. The firm’s 16,000-plus financial advisors serve more than 7 million clients and care for $1 trillion in assets under management. Visit the firm’s website at www.edwardjones.com and its recruiting website at www.careers.edwardjones.com. Member SIPC.